SUN is formed by student councils whose school as an institution is a member of the union. These are organised throuh their region, but are members of the national organisation. It is possible to become an individual member of SUN. Nearly 360 schools are organised nationwide, so the union represents over 150,000 students. The students are no members of the organisation. Two representatives from each member-school can attend the general assembly, only one with the right to vote. €1 mil of administrative grant form the Ministry of Education, project funding and organisational grants from the National Youth Council. Membership fees for schools are calculated with €1 per school-student enrolled. Board (16 people) is working full-time in office in Oslo. President and Secretary General are the only ones paid for their work. EONs predecessor, NEO (Norwegian School Student Union) was founded in 1994 when a fraction of board members from NGS (Norsk Gymnasiastsamband) left the organization. NGS was founded in 1959. These two organizations formed EON in 1999. Every year, each region has 1 annual assembly, and 3 assemblies. The annual assembly is equivalent to the General Assembly at a national level. The other 3 assemblies are held to update of elaborate the documents adopted at the annual assembly. 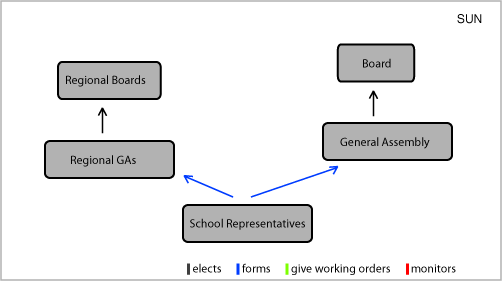 This is also the purpose of Landsstyret in relation to the GA. National and regional boards are only supposed to do the work that these assemblies state that they should. The student councils are the once that send representatives to both regional and national assemblies. Pupils from grade 4 to 13 are required and have the right by law to form student councils” and in the end “Student councils represent the pupils in school bodies, such as the school board and school environment committee.The student councils have the right to participate in all decision making processes regarding the school, and should always be represented with as many students as there are teachers. Students participate in the development through EON. At a school level, the different decision making processes include students at all levels. In each region, SUN helps students be included in local decision making, and EON as a national organization does the same in national issues. School students are heard in a large extend. EON has a lot of credibility with the Norwegian politicians and other organisations. Therefore, through EON, it is easy for school students to be heard. Technically, nothing prevents school-student representation. The biggest challenge in this area, is making the school students wants to get involved.